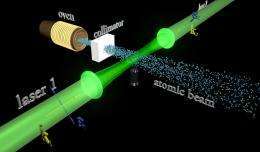 (PhysOrg.com) -- Of all the assumptions underlying quantum mechanics and the theory that describes how particles interact at the most elementary level, perhaps the most basic is that particles are either bosons or fermions. Bosons, such as the particles of light called photons, play by one set of rules; fermions, including electrons, play by another. The theories of physics - including the most comprehensive theory of elementary particles, Quantum Field Theory, which explains nature's electromagnetic, weak and strong nuclear forces (but not gravity) - rest on fundamental assumptions, said Dmitry Budker, UC Berkeley professor of physics. These assumptions are based on how the real world works, and often produce amazingly precise predictions. But some physicists would like to see them more rigorously tested. “It’s a shame that no simple explanation exists,” said Budker, because it ties together basic assumptions of modern physics. "Among these assumptions are Lorentz invariance, the core tenet of special relativity, and invariance under the CPT (charge-parity-time) transformation, the idea that nature looks the same when time is reversed, space is reflected as in a mirror, and particles are changed into antiparticles. Lorentz invariance results from the entanglement of space and time, such that length and time change in reference frames moving at constant velocity so as to keep the speed of light constant. ”Another one of the assumptions of the spin-statistics theorem is microcausality,” said UC Berkeley post-doctoral fellow Damon English. "A violation wouldn’t exactly be the same type of paradox as travelling back in time to kill your great-grandfather, but more along the lines of receiving a flash of light before it was emitted." The experiment bombarded barium atoms with photons in two identical laser beams and looked for evidence that the barium had absorbed two photons of the same energy at once, thereby kicking an electron into a higher energy state. The particular two-photon transition the scientists focused on was forbidden only by the Bose-Einstein statistics of photons. If photons were fermions, the transition would “go like gang-busters,” said English. More information: “Spectroscopic test of Bose-Einstein statistics for photons,” by Damon English, Valeriy Yashchuk, and Dmitry Budker, appears in the June 25 issue of Physical Review Letters and is available online. ..among these assumptions is the boson/fermion dichotomy, which is mandated by the Spin-Statistics Theorem of quantum field theory.. Different assumption I think. I didn't see anything in this article relating the boson/fermion dichotomy to particle-wave duality. If there is, I would to see it. I may have missed it in school. Why just in this article? Physical connections are universally valid. There is no connection between wave-particle duality, and boson-fermion dichotomy. Both bosons and fermions can act as particles, and as waves, depending on measurement conditions. It's just that most fermions have a rather smaller wavelength, than most frequencies of light up to gamma rays. It's related to energy content: an electron represents a lot more energy than a typical (non-gamma) photon -- according to e=mc^2 -- and so an electron will have a correspondingly vastly smaller wavelength. They form standing waves and each wave with the same spatial quantum numbers can accomodate 2 electrons: One with spin up and the other with spin down. Such a single-wave MUST thus be a boson-entity; but these bosons do NOT follow Bose-Einstein statistics! This obviously violates the "spin-statistics theorem". One ONLY needs one example of a violation to prove that a theorem is wrong. Furthermore the collection of donor electrons at sites which can be singly-ionised, forms a collection of fermions at low temperature, which no not adhere to Fermi-Dirac statistics: In contradiction they are all at the same lowest energy for low temperature; ignoring small differences due to a lack of perfect crystal symmetry. So fermions CAN form a condensate. Clearly the spin statistical theorem depends on more than mere spin and therefore quantum field theory is claptrap! In low-dimensional systems interactions between electrons or atoms lead to the formation of quasiparticles (anyons, like the Cooper pairs, for example) that break the fermion–boson dichotomy. There is no connection between wave-particle duality, and boson-fermion dichotomy. It's just another version of particle wave duality, nothing else. When I try to answer Jigga by quoting him/her my submission fails every time. I will try gain tomorrow. What dichotomy and how is it "broken"? ALL "charge-moving" entities within a material are "quasiparticles": What it means is that they ALL are wave-superpositions. These would not be possible if "particles" existed! Wave-particle duality only exists in the thoughts of a person with severe bipolar disorder! It requires psychiatric help and does not belong in physics! ..Wave-particle duality only exists in the thoughts of a person..
Wave-Particle Duality was first encountered in Young's diffraction experiment, conducted in 1801. Other demonstrations include: photon interference experiments (such as the Rochester experiment), quantum-coherence experiments involving Bell's theorem, electron diffraction experiments, Compton's scattering, photoelectric effect and many others. In 1929 Prince Louis-Victor de Broglie was awarded the Nobel Prize for Physics for "his discovery of the wave nature of electrons". Wave-Particle Duality was first encountered in Young's diffraction experiment, conducted in 1801. Seneca, Alizeev, now Jigga: I know your style and absence of logic by now. The only problem is that you might convince me not to take note of people like you. That would mean that I will have become just as closed-minded as the people who are in charge of the physics-church at present. Young's diffraction experiment DID NOT prove wave-particle duality in any manner; unless one is stupid enough to believe that the image which forms as spots on a photographic plate proves the existence of particles. It only proves that light-wave energy is interacting with absorbers within the photographic plate which have atomic dimensions ("spot-sizes"). The spots are caused by the characteristics of absorbers in the plate NOT by "particles", just like a radio-antenna only absorbs a smaller part of a radio-wave stretching over kilometers. The amount absorbed is determined by the antenna. ONLY a photon-WAVE can split into two parts which can follow two equivalent paths while remaining a single entity: Just as an electron-wave around a nucleus can exist of several parts (consider a d-wave) and still be a single wave. Thus, the photon interference experiments prove beyond any doubt that a photon MUST BE a wave which can morph in shape and size when changing its boundary conditions. In these experiments a photon-wave adapts to boundary conditions to form two fractions; each following its own path so that they can interfere at the end of these two paths. When, however, measuring where the photon-wave is before it reaches interference one changes the boundary conditions: The wave morphs into a wave with a single intensity which cannot interfere anymore. Why do you need wave-particle duality if the result is causal": Exactly what is expected from wave-behaviour? When two "particles" entangle one has two waves which merge completely to form a new wave-enity. There are then not two separate wave-entities anmore; just as one ends up with one drop of water after two drops have merged. When now measuring a characteristic which can only be the property of one of the entangled waves, the single wave-entity disentangles to become two seperate wave-entities which obviously MUST be correlated. Have you got a photograph of two "particles" scatterring. All you have is the conservation of energy and momentum. It is more logical to argue that the light wave is absorbed by the electron wave to increase its mass-energy. When this mass energy is larger than the rest mass energy the electron wave is free to be ejected. Why invoke "particles" when all can be causally explained in terms of known wave-interactions? In 1929 Prince Louis-Victor de Broglie was awarded the Nobel Prize for Physics for "his discovery of the wave nature of electrons"
He deserved his Nobel Prize. A pity that nobody realised that his relationship is ONLY valid for a MOVING electron-wave; Not for a stationary electron-wave, like an electron around the nucleus. The latter wave has no momentum at all and if de Broglie's relationship still applies it would mean that such a wave must have an infinitely long wavelength. NOT possible! It is exactly here where quantum mechanics went wrong and why the Copenhagists had to formulate their uncertainty for position and momentum. There can be no "uncertainty" in the position and momentum for ANY entity with mass, since it would violate Galileo's concept of inertia AND Newton's definition of mass. In fact, if there could be such "uncertainties" ALL equations in physics, including Heisenberg's matrix mechanics and Schroedinger's wave equation, become null and void! Look, johanfprins - the particle-wave duality is artifact, which people didn't expected, neither predicted - they revealed it with experiments. For most of physicists it was quite surprise, when they observed diffraction of electrons with double slit or particle behavior of light waves during photoelectric effect. They simply didn't predict and/or expected it at all - the theory for these phenomena was developed just many years later. In this sense the further discussion about relevancy of particle-wave duality has no deeper meaning for anyone: this is simply the way, in which things are going in experiments - and the experiment always goes first in physics. Because physics is based on experiments - not on the belief in abstract theories. Exactly: This means that you should not be so stupid that you INTERPRET an experimental result as if it caused by a particle (an abstract theoretical idea) while it need not be, and actually is NOT the case at all. There is not a SINGLE experimental result in quantum mechanics which require "particles" to explain it. So why do you insist on bringing on this totally abstract entity; which you are not even able to define, let alone able to see? There is not a SINGLE experimental result in quantum mechanics which require "particles" to explain it. In double slit experiment the resulting picture at the target is still composed of dots. johanfprins, I gathered the opposite is true. Richard Feynman explains that light is corpuscular and no experiment requires the use of a wave model to explain the results. Something like light diffraction or refraction can be explained using a quantum particle model as used in quantum electrodynamics. I believe the photo electric effect is proof that light is a particle and is taken advantage of in photomultiplier devices used to detect photons. From what I've learned the wave-particle duality is not an accurate way of describing light and that although wave models of light are useful tools in the majority of classical situations they're a simplification of a deeper quantum mechanical world of light paritcles. Photo-electric effect: You send in a light-entity of a certain frequency and out comes an electron with a certain kinetic energy. To conclude that this proves "particle behaviour" you first have to define what a particle is. What is its size? If it has size its energy must occupy a region in space: This means it is a field. To be a particle it can have no size: A point with no size is a mathematical abstraction and is not physically realisable. Below what size is a field "a partice"? The fact that the "picture" of a double-slit experiment is composed of dots, does NOT prove particles, it only proves that there are only sites ("antennas") of atomic size at which light can be absorbed: Therefore dots! The result is determined by the apparatus. If the apparatus requires that a wave covering the whole screen must collapse in order to be absorbed, the wave will morph in shape and size to adapt to these new boundary conditions: This is what waves do best!!!! ...light diffraction or refraction can be explained using a quantum particle model as used in quantum electrodynamics. Richard Feynman had to subtract infinitely large numbers from each other and assume that he obtains finite numbers. Even he called it "hocus-pocus". Yes this is the BIG lie in physics which became accepted and is causing us to waste billions of dollars on irrelevant research. There are no light particles, not even at a "deeper level"? The fact that a light wave with frequency nu cannot have less energy than h(nu) does not make it "a particle". Electron-waves can absorb and emit light waves: Furthermore both waves can morph to adapt to new boundary conditions. This explains ALL QM. No "particles"! Johanfprins: If your point is that 'particles' in the microscopic realm don't behave like shrunken macroscopic bowling balls, then I don't think you'll get an argument. It's probably better to call them quanta. You're missing a big point in PE: If light interacts purely as a classical wave, turn your intensity way down. It should then take the metal a long time to absorb the energy of the wave and eject an electron. But if you do the experiment, you'll find that the electron comes out right away. PE is just one piece. There are countless scattering experiments, starting with the earliest bubble chambers, that validate the particle nature of light. I appreciate your intentions, but we just cannot detect photons in bubble chambers so easily - they don't leave ionized tracks there. @jigga, of course photons don't leave tracks in bubble chambers. i didn't say they did. i said "scattering experiments, ... starting with bubble chambers ..." are you implying that bubble chamber scattering experiments *don't* validate the particle nature of light? ..It's probably better to call them quanta. So a solitary electron is a quantum? Of what? If light interacts purely as a classical wave, turn your intensity way down. It should then take the metal a long time to absorb the energy of the wave and eject an electron. Why? If the light wave has just the right amount of energy to resonate with a single electron-wave it will be absorbed by such a single electron-wave. Where does this violate classical wave theory? How else will an electron-wave absorb a light wave? Hoorray Jigga: For once we are seeing eye-to-eye. I cannot see how bubble chamber experiments valididate the "partilce nature" of anything in the universe. monad should explain in more detail why he reaches this conclusion. What is a particle? The quantum field of electrons. If you don't know that, you don't know anything, and have no business arguing. Why? If the light wave has just the right amount of energy to resonate with a single electron-wave it will be absorbed by such a single electron-wave. Where does this violate classical wave theory? What you're saying isn't even a decent fake of a physical argument. It's just plain wrong. If you want more details, start with an introductory physics text. Which quantum field of electrons? If you refer to quantun field theory you are referring to a model which is cooked and fudged by renormalisation to get what you want. This is what first year students do in the laboratory: It has no place in real physics. Why is it not a "decent fake of an argument"? Please act with dignity and argue physics instead of throwing your rattle out of your cot. Does your introductory physics book not teach you that an electron wave around a nucleus can absorb light? Tsk. Tsk. Where have you studied physics? If you refer to quantun field theory you are referring to a model which is cooked and fudged by renormalisation to get what you want. This is what first year students do in the laboratory: It has no place in real physics. Oh my God. How did you find out?! We've worked very hard to keep the secret safe in our global society's vault. Well the jig is up. I guess I just better pick up my rattle, tell the other fake physicists that the charade is over, and waddle off. Well done. Physics is yours now, take care of it. Bye. If this remark does not prove that you need help, nothing else will ever do so. You did catch me with a red herring by substituting the word "quantum" for "particle". This is semantics: The discussion was whether a "particle" occupies space no matter what you call it. The same goes for your idea of a "quantum". If these entities have energy which occupy space they CANNOT be "particles" or "point-quanta" but must be fields. Maybe you should try and grow-up! I cannot see how bubble chamber experiments validate the "particle nature" of anything in the universe. Jigga, I am not going to respond to your ignorant antics anymore before you are able to define what you mean by a "particle". And please do not show a duck swimming in a pond or try to get your lack of understanding through by using other names or countries. Any charged entity, like an electron-wave with a centre of charge, will cause a path in a bubble chamber. ..what you mean by a "particle". And please do not show a duck swimming in a pond..
Actually such duck spreading ripples at the pond surface can serve as a good prototype of quantum particle, which exchanges the energy with its environment via waves. The main difference there is, the path of duck is defined by the way of most effective wave spreading, because vacuum is behaving like soap foam, which gets more dense during shaking temporarily. In such way its possible, the waves dispersed or reflected around duck by obstacles are predetermining the future path of duck swimming through double slit experiment in accordance to principle: "matter tells the space, how to curve and the curvature of space-time tells the matter how to move". IMO this principle of relativity is maintained even at quantum scale. I can use Einstein's definition of particle in this context, too: by Einstein "particle" is the object with "center of mass". Wave has no intrinsic center of mass apparently. I can admit, the duck object is formed internally by nothing, then the dense cluster of particles and waves in nested fractal way. The more distant such perspective becomes from human scale (both at the cosmological distance, both at the Planck scale), the more such picture becomes fuzzy: the relative mass density of particles decreases, whereas the relative energy density of waves increases, until the whole particle-wave mixture changes into random noise. Actually those, who know about relativity know well already, the notion of particle is the more preferred, the higher is the relative speed/energy of objects and their observer and vice-versa: the photons of gamma rays are spreading like particles through spark chamber, whereas microwave photons are indistinguishable from common waves. And photons of radio waves probably don't exist at all - they would dissolve in CMB noise. by Einstein "particle" is the object with "center of mass". Wave has no intrinsic center of mass apparently. An object "with a centre of mass" can be a hollow sphere: Obviously only an idiot will define a hollow sphere as a "particle". Any extended body consisting of mass-energy has a centre-of-mass. Thus a wave-field with its intensity equal to mass-energy will also have a centre-of-mass. But it is still a wave UNLESS it occupies no volume at all. So I am PLEADING again that you and those physicists using the concept of "particle" must define what a "particle" actually is. In this respect you are like the superconductor physics sect who talks about "zero resistivity", without defining what zero resistivity is when a current is flowing through a material. Nobody has ever defined it up to the present. One cannot argue logical physics with people who are unable to define the concepts that they are using. Well, I'd say the above posts establish the Jigga == Alizee identity very firmly and incontrovertibly. Jig's up, Jigga. If you're going to deny wave-particle duality of photons, and insist that photons are purely waves, you'll need to explain how a single isolated photon can propagate through space for 15 billion years, without dissipating, or increasing its electromagnetic cross-section, before impacting upon and being entirely absorbed by a single highly-localized electron. You ask, what is a particle. Well right back atcha: what is a wave? What's "waving" out there, and if it's not made of "particles", then what's it made of? The truth is, both the particle abstraction AND the wave abstraction are equally axiomatic and abstract. We do not truly understand the underpinnings of space-time-energy-matter: we have no idea what it's all really made of, or how it all really works deep down. Or rather, we have /some/ ideas (e.g. M-theory), but are yet to test them. Does anyone here have anything to say about the experiment in the article? Does anybody understand it well enough to explain it? ...how a single isolated photon can propagate through space for 15 billion years, without dissipating, or increasing its electromagnetic cross-section, ..
We are finally discussing physics and not a duck in a pond. The shape and size of a light wave is determined by the source. If you have a coherent source the wave will not spread in the direction of movement; only laterally. Since a "single photon" source is coherent (it has a single value for both frequency and wave number) a photon is really a small slice of a laser beam. It can spread laterally: As have been shown by experiments in Austtralia its cross section can eventually stretch over square kilometers. When it encounters an absorber and resonates with it, it experiences a change in boundary conditions. This forces it to morph: According to the Copenhagen misinterpretation the "probabilty-wave" "collapses". That said: It is well known that incoherent light spreading from a point source becomes coherent. A light wave with a specific frequency coming from a far-away star is thus coherent. The wave is an entanglement of millions of photons: By entangling, the photons MERGE to form a single coherent wave (like a laser beam). When this entangled wave finds resonance with a single highly localised electron, it disentangles a piece of its light-energy (what we call a photon) to be absorbed. The latter also happens for cavity radiation: The light waves are standing waves within the cavity since the boundary conditions DEMAND that it must be so. The boundary conditions, however, do not cap the energies of these waves to be only of quantum-magnitude. Planck only postulated that such a wave cannot have less energy than a quantum. When one of these waves resonates with an absorber in the wall, it disentangles a quantum of energy which is then absorbed. A piece of a wave is still a wave! Take such a photon that has traveled toward a pinhole camera from the edge of the visible universe. What would its cross-section be after it covered 14.7 billion light-years? Why should it then magically squeeze through the opening of a pinhole camera that can be as small as the photon's wavelength, then reliably reach a photodetector array at a highly-specific position such that drawing a straight line from it through the pinhole, creates a "ray" that aligns precisely with a spacetime geodesic connecting its emitter 14.7 billion years ago to the precise electron which ultimately absorbed it? I am sorry but for some reason I cannot connect to physorg from my computer. I am just slipping in this note on another computer to confirm that I will be back to try in wipe up the nonsense VestaR, Jigga what-have-you has posted here. A light wave, moving with speed c is caused by induced electric-magnetic fields which wave harmonically. This is what it is even when it has the lowest energy allowed: namely a quantum of energy: i.e. when it is a "photon". Its size and shape is determined by boundary conditions. When ignoring boundary conditions one is doing voodoo. When trapped, the boundary conditions can cause a light wave to become a standing wave with zero speed. Its energy then becomes inertial energy which can be weighed: i.e. mass energy. This contrasts with a light wave moving with speed c which has no inertia and thus no mass energy. An electron wave can never move with light speed. Therefore there is always an inertial reference frame within which it must be a stationary entity: So that its total energy is its rest mass energy. It is exactly for the latter reason why the wave amplitude must be a complex function. When plotting the time diagram of its phase angle at any position within the wave, one finds that the waving cannot occur within 3D space but only within two extra dimensions outside of its 3D intensity. Therefore, unless the boundary conditions change, time does not exist within this intensity distribution. For this reason this distribution represents a time-independent mass-energy and the curvature of space around it. Its intensity within 3D space has a stionary centre-of-mass (COM). Where is the "particle" with kinetic energy which can be anywhere within it? extended body with a COM. ..a photon that has traveled toward a pinhole camera from the edge of the visible universe. What would its cross-section be after it covered 14.7 billion light-years? etc. Even according to the Copenhagen interpretation a "photon" light-wave can be square kilometers large when reaching us: It then collapses to allow the photon to move through the pinhole. This is absurd since the latter "collapse" is treated as a "probabilty" when making a measurement. Since the wave is square kms large this implies that when the "pinhole-measurement" is made the photon will more probably appear in space around the pinhole. One will NEVER be able to capture a photon in this manner. One has to accept that the wave is an actual light wave which, when encountering the pinhole collapses and moves through the pinhole: It is not a "probable" collapse but is CAUSED by the new boundary conditions (BC's). A wave MUST morph "instantaneously" when its BC's change: quantum jump! A light wave, moving with speed c is caused by induced electric-magnetic fields which wave harmonically. Of course, but what are "fields", what are /they/ made of, and what mechanism is responsible for their "waving"? You see, "fields" are just another abstraction -- like "particles" and "waves". It's a word denoting a package of mathematical equations, but it does not necessarily correspond to any real object: perhaps it merely models a particular aspect or a particular projection or a particular subset of the real phenomenon. Its size and shape is determined by boundary conditions. When ignoring boundary conditions one is doing voodoo. What are the boundary conditions of a photon in deep intergalactic vacuum? Must its size and shape expand to fill cubic gigaparsecs? When trapped, the boundary conditions can cause a light wave to become a standing wave with zero speed. Its energy then becomes inertial energy which can be weighed: i.e. mass energy. Not quite. According to GR, even moving photons have mass, and can be weighed (i.e. they warp spacetime.) Get enough of them together in a small volume, and you can build a black hole purely out of photons. This contrasts with a light wave moving with speed c which has no inertia and thus no mass energy. Careful: photons have momenta, and they travel on geodesics. These are both attributes of inertia. It's true that they have no /rest/ mass, but they have inertial and gravitational mass nonetheless. Of course, but what are "fields", what are /they/ made of, and what mechanism is responsible for their "waving"? etc.etc. Are you Jigga in a more intelligent guise? The abstraction is "energy" NOT a field: Without the abstraction of "energy" we do not have physics at all. A field is a REAL region in 3D space which has distributed energy within it. A harmonic-wave is then a REAL field which changes with time in such a way that each point that waves can be represented by rotating phase angle: To be a harmonic wave the latter phase angles have a specific positional relationship within the field. A light wave propagates by electromagnetic induction. It is experimentally established that such induction exists and is therefore REAL: I cannot understand why you call it an abstraction. Copenhagen..: it says QM is just a mathematical framework that allows us to predict experimental outcomes, but..etc. This argument corrupted physics: Replacing it with voodoo. What are the boundary conditions of a photon in deep intergalactic vacuum? Must .. gigaparsecs? The BC's of a light wave moving with speed c are its source and any other changes in space outside of the source. If you solve a wave equation without specifying any boundary consitions you are doing voodoo. How much it spreads is determined by the source. Experiments prove that a light wave from a faraway star can spread over kilometers. Gigaparsecs have not been measured for such light and is thus pure speculation on your part. Exactly: In SR no boundary conditions are assumed outside a light source. In GR boundary conditions are taken into account. This is why light speed can slow down below c and why light can now have inertia and thus mass-energy. Get enough of them together in a small volume, and you can build a black hole purely out of photons. Further prove that boundary conditions (small volume) can cause the energy of a light wave to become mass. You do not require a lot of photons to change light energy into mass energy. A single photon-wave changes its light energy into mass energy when it is absorbed by an electron-wave around an atom's nucleus. When I talk about inertia I interpret it as Galileo has defined it. The entity can be stationary within an inertial refrence frame. Not dynamic inertia. A light wave moving with a speed c does not have such inertia. Boundary conditions (space-time curvature) allows a light wave to pick up such inertia. Thus what you are saying does not contradict anything I am saying.